Despite all the noise Ubisoft made last year about the strength of its partnership with Microsoft, Splinter Cell: Conviction Creative Director Max Beland said that ultimately, the franchise will go where the money is - including to the PS3. 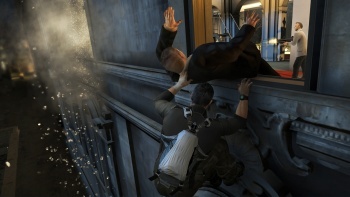 Developed for the Xbox 360 and PC, Splinter Cell: Conviction was described by Ubisoft as a "true Microsoft exclusive," thanks in large part to the "really strong partnership" between the two companies. "We've been working with Microsoft for a while now," Ubisoft Montreal Producer Alexandre Parizeau said last year. "We've been working with their engineers - we've had super good feedback from them on all sorts of different things. It's been a really good partnership with them." But times, and hearts, do change. While it's unlikely that Conviction will ever end up on the PS3, there's a fair likelihood that some future Splinter Cell release will; the exclusivity deal between Ubisoft and Microsoft ends with Conviction and if Sony wants to get in on the action at that point, Beland doesn't see any reason why it shouldn't. "I'm not involved in the business deals. I joined Splinter Cell after the exclusivity deal with Microsoft had already been signed, but there's no reason why Splinter Cell couldn't be on the PS3," he said in an interview with Edge. "Conviction? No, because of the exclusivity deal. I know people keep talking about maybe, maybe not, [but] at Ubisoft Montreal I haven't seen anyone working on PS3 for Conviction." "[The next game] is open to new deals," he continued. "If Microsoft wants an exclusivity deal, they don't call me, it's Yves [Guillemot, Ubisoft CEO] dealing with the business people. But yeah, I guess we could even be a PS3 exclusive if there's a deal that makes people happy there." Regardless of what platform it ends up on, Beland said the next Splinter Cell game will probably be turned around quicker than Conviction thanks to Ubi's overall strategy to speed up franchise releases. "I'm not telling you that yes, in a year you'll have another Splinter Cell," he said. "But right now the direction Yves gave us and where the company is going to go is, at one point, if the direction doesn't change, yes you're going to be seeing Splinter Cell games, just like Assassin's Creed games, just like anything else, released a little bit more often." Splinter Cell: Conviction is currently scheduled for release on April 13.